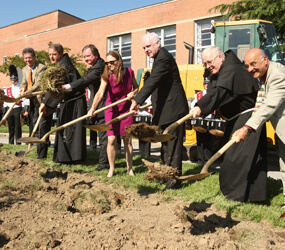 Saying Baltimore’s Archbishop Curley High School was following in a long Catholic tradition, Archbishop Edwin F. O’Brien helped break ground on the school’s $4 million arts facility May 19. 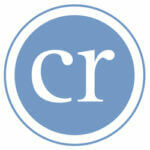 The project received a significant boost from Gerry and Connie Holthaus, who gave $1 million. Gerry Holthaus, a 1967 graduate of Curley, is chairman and CEO of Algeco Scotsman, a modular space provider and parent company to Williams Scotsman, Inc., which is headquartered in White Marsh. According to the school’s facility manager, John Kogler, the new building will be about 12,000 square feet and contain designated areas for visual arts as well as instrumental and vocal students. The visual arts area will include a classroom and a studio. Vocal and instrumental groups will each have large practice areas. Students in the bands and choruses will also have individual practice rooms. Students in the celebrated arts program at Curley currently have about 5,000 less square feet to work with at the school. Rubeling & Associates served as the architecture firm for the project with Dave Recchia serving as lead designer. Construction is expected to take a little less than a year to complete. Democrat state Senator Nathaniel McFadden, who represents Baltimore City, helped procure $200,000 in grant money for the project. The Curley chorus sang the national anthem and the school alma mater to kick off the event. The school’s drum line also played as well. Conventual Franciscan Father Michael T. Martin, a member of the school’s class of 1979 and current president of Curley, said the said the project took flight because of supporters. Kogler said Father Martin’s legacy will be connected with The Holthaus Center.